The Chapin Premier 1 Gallon Poly Sprayer 21210 has now been upgraded to the 21210XP. The XP stands for Extended Performance. The Chapin Premier 1 Gallon Poly Sprayer 21210XP is part of a superior line of consumer sprayers designed to rival those used by the pros. The Premier features Chapin’s patented SureSpray Anti-Clog Filter, a large 4” opening for easy filling and cleaning, translucent bottle for ease in checking fluid level, an auto/manual high pressure relief valve, and an adjustable cone nozzle. 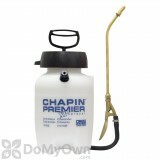 The Chapin Premier 1 Gallon Poly Sprayer 21210 has now been upgraded to the 21210XP. The XP stands for Extended Performance. Chapin has redesigned the pump to use a plunger cup (like what is found in industrial concrete sprayers) instead of an o-ring. The plunger cup is a more reliable part as it will not slip off as o-rings sometimes have a tendency to do. The Chapin Premier Poly Sprayer is part of a superior line of consumer sprayers designed to rival those used by the pros. The Premier features Chapins patented SureSpray Anti-Clog Filter, a large 4 opening for easy filling and cleaning, translucent bottle for ease in checking fluid level, an auto/manual high pressure relief valve, and an adjustable nozzle. I have bought sprayers in the past with the flimsy (plastic) wands and cheaply constructed connections. This sprayer has a metal wand, solid connections. You can tell it is made for years of use and commercial applications. I really like being able to release the pressure in the tank but just turning the little knob on top of the lid. You will love this sprayer. I found this sprayer would constantly need tightening and adjusting at the metal nozzle, and where the metal handle is attached at the wand. It was a constant battle to control leakage and waste of insecticide. Even my husband checked these seals and brass tighteners to be sure they were put together correctly. Some part of those components are too large to keep a good seal. Felt it was also not easy to control the amount of product sprayed, both in a more concentrated stream and a wider spray without constant adjustment. Just didn't want to hold position, and would quickly get out of adjustment. We will be on the hunt for a better sprayer in one of the local home improvement stores. Sprayer, wand, relief valve, handle and lid are all fantastic! However, two issues: 1) The cutoff in the handle lags, so liquid runs down the wand after you release the handle. 2) The nozzle is excellent for outdoor use, but the nozzle will not close enough to create a fan spray inside the house. The result of these two combinations, creates dribbling of residual liquid in the wand after cutoff, which in-turn pools out of the end of the nozzle. Additionally, I cannot locate a fan spray nozzle for this sprayer on this web-site. I have never needed a sprayer before and wanted functional, high quality construction without unnecessary material costs or features. I have been completely satisfied with the Chapin Premier Pro which I purchased to spray Boracare on base plates. I believe the smaller one gallon size has been an advantage for maneuverability in awkward access areas. I, too, have recognized a tendency for dribbling from the nozzle but have found two tweaks to eliminate the problem. First, if a dribble starts, I pump a little more pressure in the tank. Second, I seem to achieve an optimum spray pattern with the adjustable nozzle fractionally opened. For such a well designed and solidly constructed unit, the range of spray patterns seems limited but it has been completely acceptable for my application. I should also note that the locating tabs on the fitting for the filter tube to the tank are a little difficult to hold in position while the hose nut is tightened but a snug fit is much better than a leak. Finally, there is a swivel trigger lock on the handle which is probably intended to maintain a stream during casual upright spraying. While releasing the trigger in contorted positions, I have had the lock pinch me. This is hardly worth noting but you may want to keep tender folds of skin away from the lock at the end of a spray. In summary, after several uses, I continue to feel this sprayer is the best purchase I could have made. This is a highly effective sprayer that does not clog up and is easy to use. Very helpful was the DoMyOwnPestControl website video that explained how to utilize a sprayer while adding a pest control powder and water to it. What sprayer do you recommend for spraying Thompson Water Seal with? The manufacturer of Thompson Water Seal recommended that you use their product with a plastic sprayer with a brass wand, such as our Chapin Premier sprayer. There are no concerns about it eroding any of the seals inside of it. Once you are done with the product, it is recommended that you run mineral spirits through the sprayer and then water to clean it. 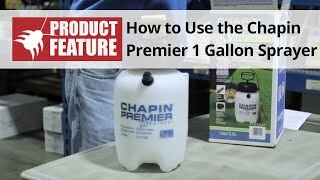 Is the Chapin One Gallon Sprayer suitable for indoor applications? That is, does it produce a fine mist? 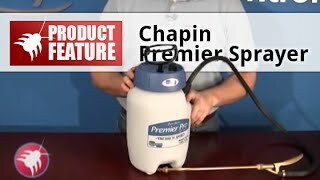 Yes, we sell this Chapin Premier 1 Gallon Sprayer as an indoor/outdoor sprayer. It has an adjustable nozzle that can go from a pin stream to a heavy fan spray to a light mist. How far does a Chapin Premier 1 Gallon Sprayer reach? The Chapin Premier 1 Gallon sprayer can reach about 10 feet when under pressure. We do sell a Chapin Slide Pump Sprayer that can reach up to 30 feet. What is the best equipment to spray under a deck? We have regular ants and carpenter ants. What is the best equipment and chemical to use under a large deck. Space under the deck ranges from almost nothing to about 8". Some areas under the desk can only be accessed through the spaces between the deck boards. You will most likely be just fine using an ordinary hand pump sprayer such as the Chapin Premier 1 Gallon 21210. In areas where you have limited access you may have to adjust the nozzle to a pin stream and areas where you have greater access you can adjust the nozzle to a wider fan spray. Is it Ok to leave pesticide in the sprayer for several days? How long can you store a pesticide inside the tank of a sprayer? Will the pesticide(s) destroy the rubber seals if left in the system? You should not store mixed insecticide concentrates for loger that 24 hours in the Chapin Premier 1 Gallon Sprayer, or any other sprayer for that matter. Concentrated insecticides will begin to separate which will clog the lines as well as destroy the seals in the sprayer. We recommend mixing a gallon at a time and discarding left over solution by pouring the solution on the ground next to the foundation of the house.